I’m looking for your opinions, rankings, best kits for sound, versatility, build and hardware quality in the approximate 1,200 to let’s say 1,800 dollar range (or under 2,000) from the major brands. As long as you get the sizes and wood type you want, I’m not sure it’s possible to go wrong, looking at your list. I’d throw Jenkins-Martin and Oriollo too, on your list. Consider INDe too. I'm very impressed by their product. Just my take but if you can go $1800 and you can get by with 2 up one down, a Saturn V exotic in cherry mist is a beautiful kit that sounds great. If you want to stay closer to $1200 I'd go Gretsch Renown RN2. You can also get a lot of value in preowned kits in that price range. Knowing what your requirements are would help a lot. Is this a practice or a gig kit? Can you play them and leave them set up in your house? What kind of music will you be playing on it? Are you OK with deep bass drums? Shallow bass drum requirements thins the herd a bit. Probably a gig kit. Rock, pop, country and blues thing. Not jazz. Your right l, bass drum sizes will narrow the field. Personally not a fan of 18 deep bass drums, so 14 or 16 depths. I guess that narrows it a bit to Yamaha (16) or Starclassics which I believe are now 14 deep, Renown 20’s are 16 deep. Anyone have any experience with rn2 20 inch bass drums? Will they carry a band? Kind of curious about the Tama Starclassics. Any input on those? They look solid with appealing sizes. 3 piece kits in the 1,200 range with excellent hardware and finishes. They are not the coveted bubinga any more though. Still deep and modern sounding? After watching a thousand demo videos, I ended up buying a Gretsch Renown RN2. It sounds better than all the others IMO, especially if you like pure tone, clear articulation and resonance. It sounds just as good as high-end kits costing 3 times as much. The Yamaha Tour Custom is a nice kit, but the toms sound a little thin imo, due to their thin shells. Tama Starclassics, they're great, but not quite the sound I was going for. They're a little more aggressive sounding than the other kits due to the Die-cast rims. The new Walnut/Birch Starclassics sound great. Pearl Studio Sessions are great too, nice hybrid blend of mahogany and birch. Ludwig Neusonics, from the few examples online, they sound pretty good. They are very bland from a visual standpoint though, and had to cut corners to get the price down to 1k. Mapex Saturn V, also great, you can't go wrong. As good as some of those kits are, I believe the Renowns are a step above, especially when it comes to sound. I got the Renown RN2 with a 20" kick. It will definitely carry a band. It's slightly quieter in volume than your standard 22x18" but not by much. I put a SuperKick II on the batter head and it sounds amazing. The new Walnut/Birch Starclassics came out after I bought my Renowns. I still would have chosen these Renowns because of the sound. The Starclassics have exceptional hardware. Arguably the best on the market, maybe even better than DW and Yamaha hardware. I am in love with the Birch/Bubinga Starclassics because of the low throaty, punchy sound they have. If I got another kit, it would probably be this one. It's a shame they were discontinued. Honestly, you couldn't go wrong with a Starclassic or a Renown. You'd be perfectly happy with either. Compare the sounds in the Youtube demos and see which sounds better to you. I don't think Starclassics or Saturns are considered mid-level (in quality). Excellent Ibite! That’s exactly what I was looking for. I agree that rn2’s are definitely on my recommend list. The new Starclassics are right up theee too. Like you referred to, a different sound quality to each. Both awesome but that Gretsch quality of tone compared to the deeper, throaty New Tama’s which I agree are arguably mid tier. I have the previous generation of the Pearl sessions. They are excellent. I have the Starclassic B/B's and they are awesome drums. Tama went to Walnunt when Bubinga became unavailable to keep the sound as close as possible.Very few people would tell the difference by ear - certainly not in a band situation. "Mid level" is a broad spectrum....in price, they are mid way between beginners and custom I suppose. As far as fit and finish is concerned, I agree they are right up there with anything you'd find in 'top' level drums. Lots of great options there. I'd be leaning towards Tama at that price range. Also, there are still some B/B kits out there at discounted prices. If you can go up to $1800 in your budget, you are probably able to go up another tier if you buy used. 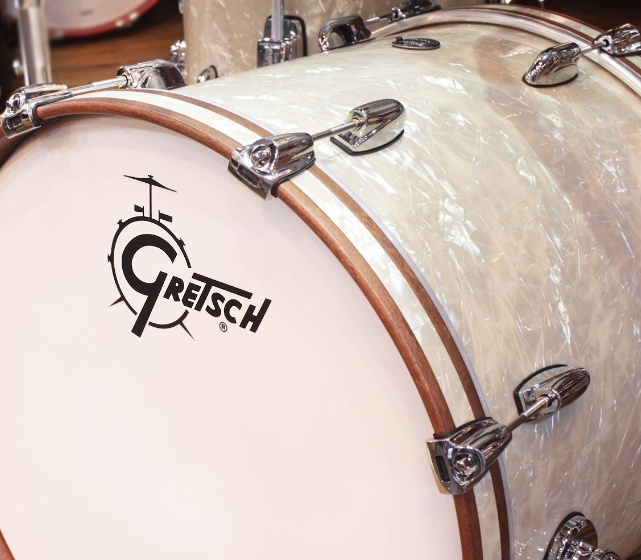 You might be able to find a good deal on a Ludwig Classic Maple or Gretsch Brooklyn, something along those lines. I recently scored a mint Sonor Vintage Series kit for close to this price. Did you get the matching snare? I got my Renowns without the matching snare, so I'm in the same boat as you. I'm also curious how it sounds and plays. But being super picky about snares, I don't want to buy it and not use it. As a cheaper compromise, I've even considered getting a new or used Marquee snare, which will sound very similar to the Renown snares, but without the 302 hoops, and the finish wouldn't match. I did however try out my 302 hoops (from my 14" tom) on my restored Ludwig Acrolite. The tone was awesome, very open sound in the best way. However rimshots were difficult to hit. I'm sure I could adjust to it, but the difference between the 302s and standard triple-flanged was noticeable. I assume a Renown snare would feel identical in that respect. So from my limited experience with 302 hoops on snares, they feel like die-cast hoops when it comes to rimshots. Which is a good or bad thing, depending how you look at it. That's what I was thinking....I consider mid level to be like Pearl Vision, Tama Silver Star and Superstar, Yamaha Stage Custom, PDP Birch kits and maple kits etc. Mapex Saturn V (which I own one) and Starclassics are pro level all the way....they may not be flagship lines but they're up there. This message has been deleted by wildbill. Honestly, if I was in college again I'd probably grab a DW Frequent Flyer since I always remembered space being a premium when I was that age. I have nothing but fond memories of my Renown, and am really glad it was my first real kit (depending on your opinion of the Ludwig Accent). That being said, I'd probably have been equally as pleased with any of the kits mentioned in the OP, despite them not meeting my self-projected aesthetic. I've always imagined the Yamaha Stage Custom to be the perfect entry level kit, and the Live Custom to be Yamaha's interpretation of the intermediate/semipro marketing echelon.